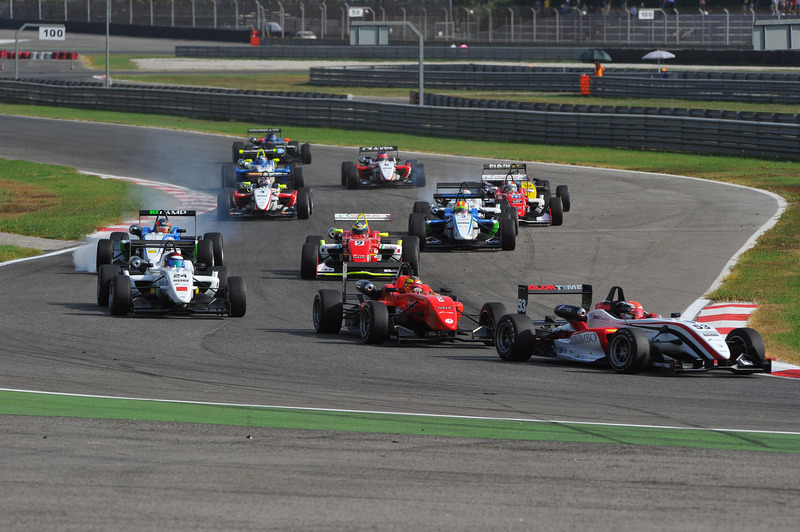 14/09/2011 - The Italian Formula 3 Championship is moving to Vallelunga for the sixth round of the season that will seethe title fight involving seven drivers, all within a bunch of points that can be obtained with race one's result. The drivers of the prestigious tricolored ACI-CSAI series, powered by Fiat Powertrain Racing since 2008, will be awaited to yet another thrilling round at the circuit named after Piero Taruffi putting on track a sportive spectacle made more interesting by the title fight that is getting in its red-hot phase. The first of the three final acts of an ever more tight championship will see Sergio Campana (BVM-Target) motivated to increase the gap that in the latest two rounds allowed him to lead the pack. The driver from Modena will aim at full points on the very same track that last year witnessed his win in race two, when one of his current rivals, Edoardo Liberati was second. The Roman driver of Team Ghinzani, author of the fastest time in the collective tests held last week at Vallelunga, will aim at capitalizing the motivation offered by his home circuit harvesting the 14 points needed to climb all the way up to the top of the classification. Liberati intends to get back the classification leadership after holding it in the first three rounds of the season but he will also have three rookies on the rampage to challenge for that position, namely the French Maxime Jousse (BVM-Target), the Swiss of Italian origins Raffaele Marciello (Prema Powerteam) and the French Brandon Maisano (BVM-Target). These three are also the drivers harvesting the highest number of points in the two rounds of Spa (Belgium) and Adria, as Jousse secured two second places and a victory, Marciello a third and a victory while Maisano a third and a second place. Michael Lewis (Prema Powerteam) temporary lost a bit of ground to these three drivers despite winning race one in Spa and holding currently the sixth position, two points shy of Liberati after the unlucky round of Adria that cost him the second absolute place and the leadership in the rookies classification that is currently held by Jousse. Seventh with 19 points to the top (a gap fillable with race's victory only - awarding 20 points) is now the Milanese Kevin Giovesi (Lucidi Motors), who is focussed in getting back to the leading group starting from race one, strong of his victory in Imola's race two and the second place in Adria. Vallelunga will also be the home circuit for an ever more convincing Eddie Cheever (Lucidi Motors), very good third in qualifying an in race one of the latest round and fourth in the recent collective test, behind Liberati, Lewis and the Argentine Facu Regalia (Team Ghinzani) with the latter following him in the ninth place of the championship's classification. Back on the podium in Adria's race two, after the second place in Franciacorta's Sunday race, the Brazilian Victor Guerin (Lucidi Motors) is ready to climb up positions in the classification where now he stands in tenth. Determined to get constantly in the top ten are Simone Iaquinta (JD Motorsport), seventh in collective test, Andrea Roda (Prema Powerteam) and Federico Vecchi (LineRace-CO2 Motorsport), all protagonists of a great race two in Adria on a treacherous tarmac due to intermittent rain. The racing weekend will start this Friday with free practice scheduled for 9.40 and 14.40 (local time, GMT+2), while qualifying will be on Saturday (11.45) followed by race one (16.05). Race two will be on Sunday at 10.10.